Don’t you hate when you finally find a reliable, easy to use WordPress service provider and they get acquired by another company? You may know how that feels since that’s what happened with WordPress support company WP Curve. Late last year, GoDaddy acquired WP Curve in an effort to expand its WordPress offering. Before anyone could blink, WP Curve stopped accepting new customers. And, anyone interested in using WP Curve for WordPress maintenance services was out of luck. Were you a previous WP Curve customer or considering their services? No worries! AccessWP is a great alternative to WP Curve. We offer a very similar pricing and service model that you’ll love! Do you have a bunch of small WordPress tasks on your to-do list but lack the knowledge or time? No problem. 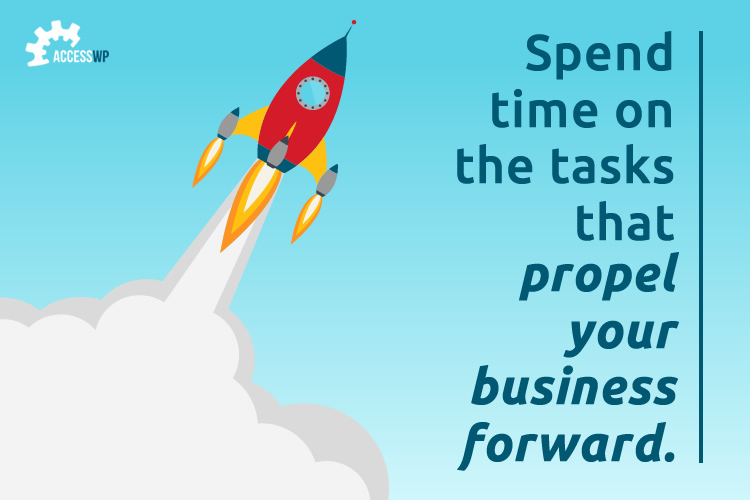 According to a business survey by The Alternative Board, entrepreneurs spend about 68% of their time working “in” the business and only about 32% of their time working “on” the business. Unfortunately, working on your business results in growth and revenue, which means entrepreneurs are missing out when it comes to outsourcing administrative tasks. 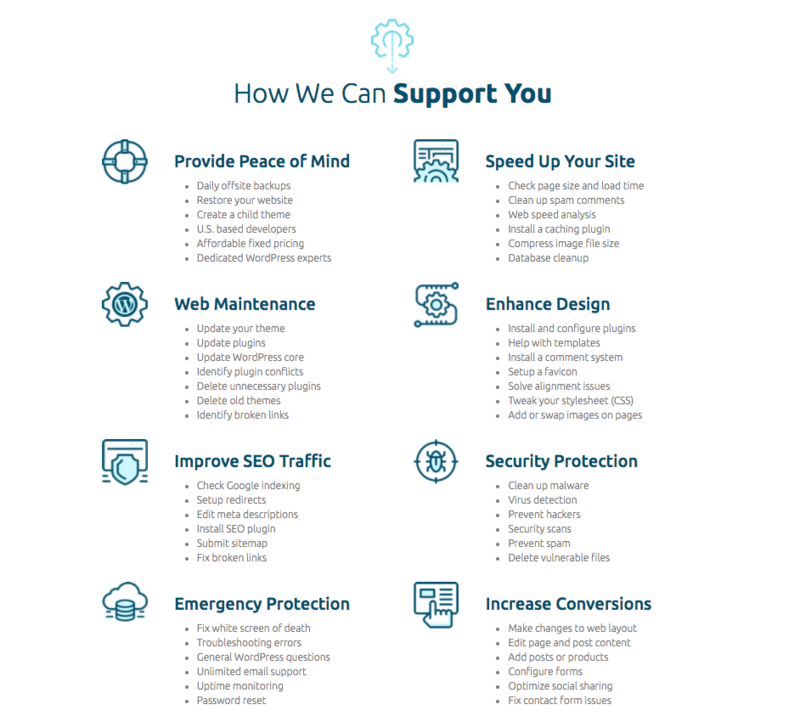 With an unlimited WordPress support plan, you not only offload some of the administrative burdens but also bypass constraints that capped plans impose. AccessWP’s standard business hours are Monday thru Friday, 9 am – 9 pm Pacific time—but with email support you can reach out to us at anytime and we will respond as soon as possible. Our skilled U.S. based developers are here to assist you. Although we complete most of our jobs Monday to Friday, we monitor incoming tasks overnight and on the weekend. Most jobs take less than 30 minutes to complete. Typically we finish a job within a couple of hours during business hours, which means you can expect to submit and resolve several jobs a day. Feel free to utilize AccessWP as your own WordPress support team. Just like WP Curve, AccessWP offers some of the best WordPress maintenance services around at an affordable fixed monthly fee. Choose from three different tiered plans starting at $99 per month. Our plans are flexible, which means you may upgrade or downgrade as needed. Also, you can cancel your plan at any time since no contract is required. 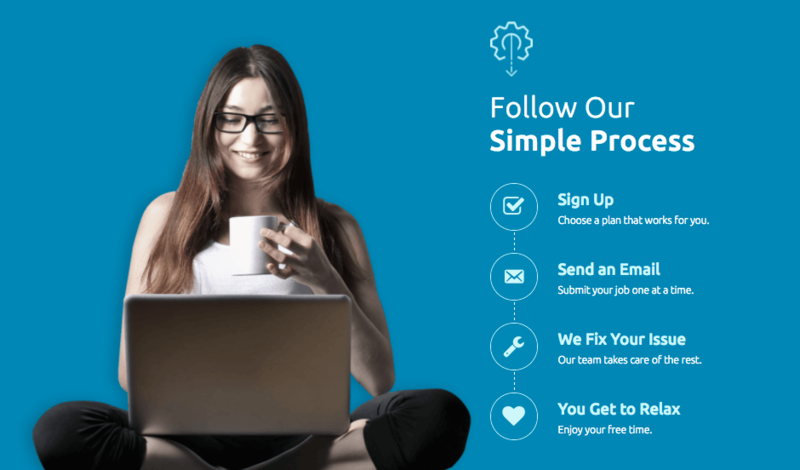 Don’t need a plan but still need WordPress support? We’ve got you covered there too. For single fixes, you can order a support ticket for $69. There’s no reason to complicate things, so we’ve kept our process to a minimum. After you sign up for a plan, you simply email your requests to us. No need to learn any new software or figure out how to submit a request. If you know how to email, then you’ll be able to work with us! We are so confident that our plans and service will meet your needs and expectations that we offer a 100% money back guarantee. Just let us know within the first 30 days of subscribing. According to Business News Daily, one of the most important tasks that a small business or startup outsources is website updates. Our team of U.S. based experts can handle almost any request that takes up to 30 minutes. We’ve completed 24,000 support tickets since 2014! If you have a WordPress design change request that exceeds 30 minutes, our sister company, Marketing Access Pass, can take care of it. For example, if you need a landing page or web page created, we can help you via Marketing Access Pass. AccessWP is committed to making our customers happy and helping them with their unlimited WordPress support needs. In fact, we have a 99/100 customer happiness rating score! 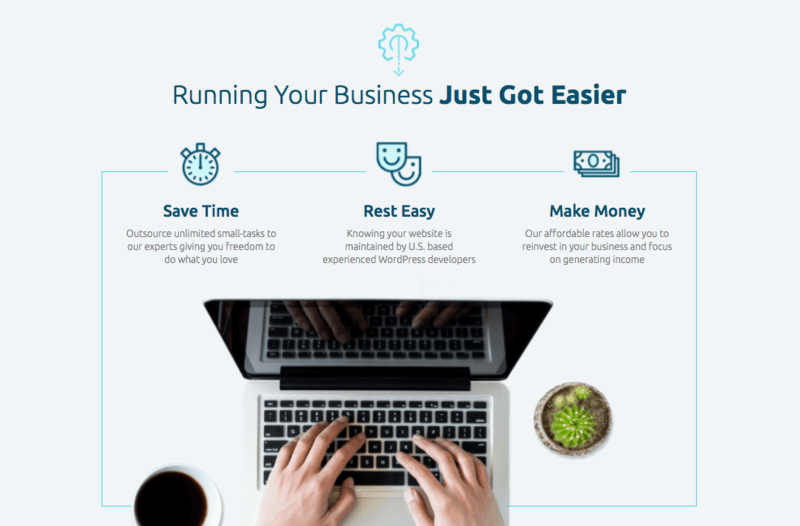 We alleviate your WordPress headaches so that you can save time, rest easy, and concentrate on other things in your business. When you need us, we’re only an email away. We are dedicated to your satisfaction. That’s why we stand behind our service with a 100% 30-day money back guarantee. Much like WP Curve, AccessWP has an outstanding team of WordPress experts waiting to help you. Experts in similar timezones make connecting easier since there are fewer time discrepancies. A team of U.S. developers minimizes miscommunication and decreases language barriers. With U.S. based developers, it’s like having a dedicated WordPress support staff as part of your local team. You can outsource unlimited, small WordPress tasks to AccessWP to give you more freedom to do what you love. With our experts managing your WordPress maintenance, you can rest easy and have peace of mind. Our affordable rates allow you to reinvest in your business and focus on revenue-generating tasks. Although WordPress is an excellent platform for running your business website, it requires frequent content updates and constant maintenance, including updates, security monitoring, backups, and more. After a while, these tasks consume a lot of time and effort, especially if you don’t have a background in WordPress. We know you like to do it yourself, but just because you can doesn’t mean you should! 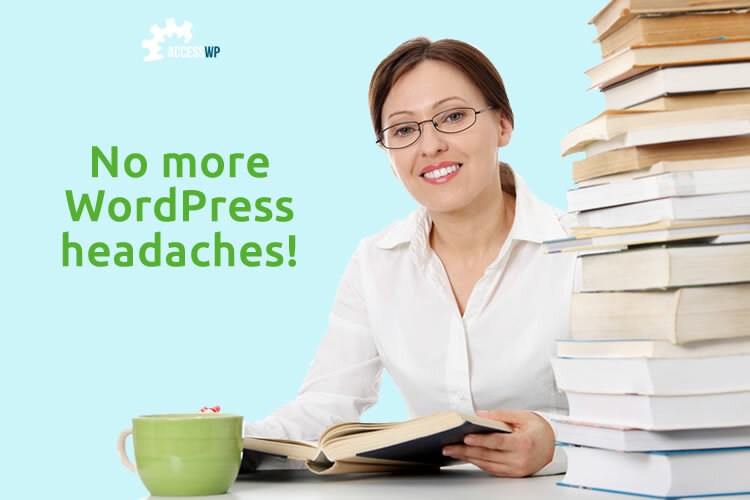 With AccessWP, you don’t have to deal with those irritating, quirky WordPress issues. You can hand it all off to us. It’s like having your own WordPress virtual assistant! As a small business, AccessWP knows what it’s like to be responsible for a million things. But, getting stuck in the daily details can be an obstacle when you’re trying to scale your business. We understand that messing around with the technical aspects of WordPress can’t be on your to-do list, especially when you need to pay attention to bigger tasks. That’s why outsourcing website maintenance is a convenient and affordable solution for small business owners and entrepreneurs. Using a WordPress support service frees up your time since you don’t have to manage your site or another resource. 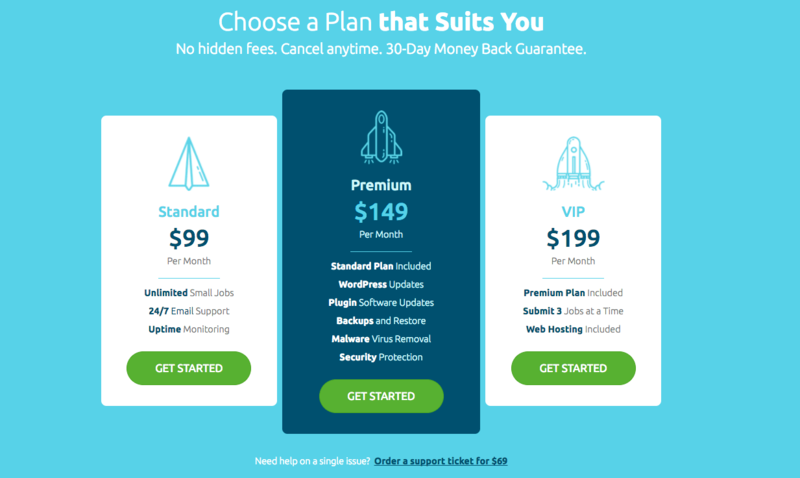 We created our pricing model and simple email process with the busy entrepreneur and small business owner in mind. We’re budget-friendly and offer unlimited small job requests to remove the hassle from maintaining your site. We’re also sensitive to your desire to save time, which is why submitting a request is as simple as sending an email. Just because you’re a small business doesn’t mean you can’t have support like a large enterprise! Turning one of your business’ most valuable assets over to a stranger is scary. It may feel risky or uncomfortable to give an unfamiliar, external person access to your website. We get it! Selecting a provider to manage your site is not a decision to take lightly. You rely on your website to generate revenue, promote your brand, and run your business. A reputable and trustworthy WordPress support provider takes this responsibility seriously. AccessWP has a good reputation and excellent track record with our customers. We complete over 1300 tasks a month and employ a team of highly skilled, reliable, U.S. based WordPress experts. Your site is safe with us! Just because you’re a small business doesn’t mean you can’t have a WordPress support team like the big boys. And, just because GoDaddy acquired WP Curve, doesn’t mean you can’t get similar support for your WordPress site. AccessWP is an awesome WP Curve alternative and offers many (if not more!) of the same services, benefits, and advantages. We love working directly with you and helping to improve your site so that you can focus on what matters most. Contact us today to get more time in your day to do the things that count.